The world had gone full token. Over the past two weeks, I’ve spoken at Consensus 2017, attended the Token Summit, and participated in a Fintech Silicon Valley panel where tokens were the primary topic of discussion. Here are some thoughts tokens and what the future may hold. Token discussion at Fintech SV. See full video at bottom of this post. The primary innovation of tokens isn’t technical, it’s social. Tokens accelerate network effects. They create an economic incentive to run infrastructure and perform tasks that benefit network participants. For example, Storj provides data storage on a decentralized network. Users who contribute storage capacity to the network are rewarded with a token. Storj tokens can be used to purchase storage on the network or sold to subsidize the contributor’s operating expenses. Tokens give early participants an incentive to join the network before the unit economics make sense. Bitcoin was initially worthless. Despite this fact, a global community invested considerable resources to develop software and build Bitcoin’s network infrastructure. Although many in the early community were motivated by ideology, speculation played a significant role. When Bitcoin got a price on May 22, 2010 it motivated developers, miners, investors, entrepreneurs, criminals, exchanges, hardware manufacturers, and many others to contribute to Bitcoin’s success. Traditional venture capital is locked up in a fund for five to ten years. Tokens present the opportunity for venture funds to issue a liquid asset. Earlier this year, I joined the Advisory Board of Blockchain Capital. They were the first venture fund to use a token to raise capital. Blockchain Capital raised $10 million of a $50 million fund by issuing BCAP tokens which represents a fractional interest in the fund. Recently AngelList teamed up with Protocol Labs to launch Coinlist, a platform for launching tokens. Over the next two years we’ll continue to see big changes in how early stage companies raise capital. The minimum requirements for an ICO used to be a white paper, a small team, and big promises. Today we’re seeing venture backed startups issue tokens as part of their business model. These companies have teams, a product, traction, partnerships and an existing investor network. Bolting a token onto an existing business can be awkward if it’s not core to the business model. It has to be central to the company’s success. For example, Brave uses a token to share ad revenue with partners and users. Users get paid for their attention. At Token Summit 2017, Olaf Carson-Wee of Polychain Capital rightly noted that we’re in the infrastructure phase. Consumer applications haven’t materialized partly because the underlying technology isn’t ready. Companies that utilize a token to incentivize the buildout of infrastructure are likely to have the most short term success. People from across the globe are purchasing tokens for a wide variety of reasons. Some see an opportunity to participate in a new wave of disruptive technology. Traders speculate on ICOs to increase their Bitcoin and Ethereum holdings. Fred Wilson is buying Rare Pepes. The market cap of all tokens is about to cross $100 Billion USD. Chris DeRose argues that token are unregistered securities and has asked the SEC to intervene. That may happen. But what’s clear is that the idea of tokens can’t be uninvented. Regulation in one jurisdiction will drive activity to another jurisdiction. It think it’s safe to say that tokens are here to stay. 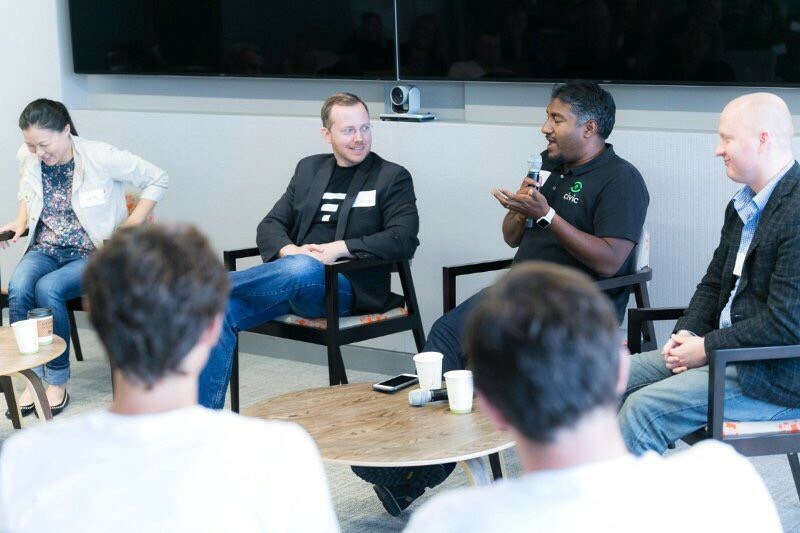 Conversation with Wayne Vaughan of Tierion, Vinny Lingham of Civic, Tim Swanson of R3, Lily Liu of 21, and Pierre Wolff as moderator.